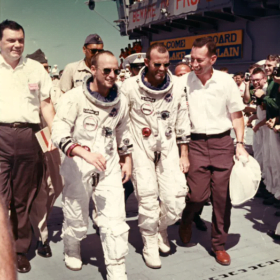 When Project Mercury astronauts Gordon Cooper and Pete Conrad splashed down in the Pacific Ocean on August, 21st, 1965, Dr. Howard Minners was among the first people to greet them. In his role as flight surgeon and chief of flight medicine at NASA-Houston from 1962 to 1966, it was Minners’ job to lead day-to-day tests, examinations, monitoring and overall health analysis of the astronauts from pre-launch to post-splashdown. He worked with most of the original Mercury Seven astronauts: John Glenn, Scott Carpenter, Wally Schirra, Gordon Cooper and new astronauts as they came on board. He shared “The Right Stuff” with the whole Mercury and NASA-Houston team from the beginnings of the Space Race with the Soviet Union. Minners moved with Eleanor to Fox Hill in 2015 and not long after unpacking rediscovered his “space box,” a cardboard crate packed with newspaper clippings, photos and other memorabilia. He uses the materials in Mercury Project presentations he has made in Fox Hill’s Performing Arts Center as well in local schools. Born in 1931 in Rockville Centre, Long Island, New York, Minners holds an A.B. from Princeton University; an M.D. from Yale University School of Medicine and a master’s degree in Public Health from Harvard. Following his service with NASA-Houston, he went on to a distinguished career. Among the many highlights are: Chief of the Geographic Medicine Branch and subsequently Associate Director for Collaborative Research with the National Institute of Allergy & Infectious Diseases, National Institute of Health; Chief of the World Health Organization’s research office, Geneva, Switzerland; Assistant Surgeon General/Rear Admiral and Deputy Director of the U.S. Public Health Service Office of International Health and Science Advisor to the Administrator of the U.S. Agency for International Development.